The Flash concludes his battle with Godspeed, and his first story arc, in this issue, written by Joshua Williamson, with some exceptional art by Carmine DiGiandomenico. I find myself really enjoying the art on this book, increasingly so as it goes on. The backgrounds are great, and the speed scenes very effective. He is very evocative in the facial expressions he gives his characters. Much of the issue is devoted to the battle between Flash and Godspeed, which Wally West joins in. There are some great moments along the way. 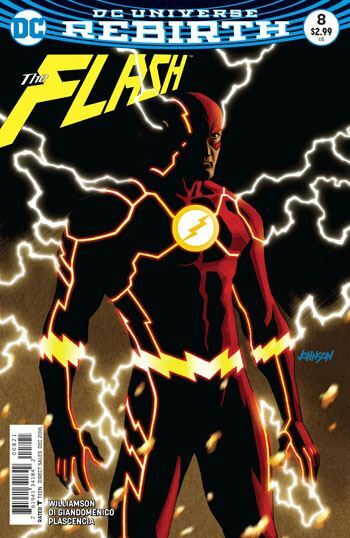 The Flash has had great difficulty stopping other speedsters in the past, and though there is no direct reference, there are moments clearly intended to remind long time readers of Barry Allen’s murder of the Reverse Flash. And though the Flash has believed that he understood everything that was going on, the reason for the sudden burst of speedsters in Central City, the role of Dr. Carver and the Black Hole, he learns that there is more to the situation than he had expected. For that matter, Godspeed learns that he has been wrong about some thing as well, and in both cases, the revelations are significant. But I would have to say it’s Wally West who winds up running away with the issue. He finally gets a Kid Flash costume, and it looks great. We also learn a bit more about what motivates Wally. The first Wally West had idolized the Flash, and so was eager to jump into the sidekick role. This Wally has a different hero to emulate, though the end result is much the same.